EU foreign affairs chief welcomes announcement of resumption of peace talks between Israel and the Palestinian Authority. 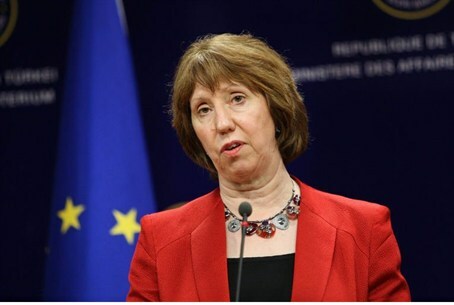 EU foreign affairs chief Catherine Ashton on Friday warmly welcomed an agreement in principle on a resumption of negotiations between Israel and the Palestinian Authority, praising the "courage" of both sides. "I warmly welcome today's announcement on the Middle East peace process," Ashton said in a statement quoted by AFP, after U.S. Secretary of State John Kerry announced that negotiators from both sides will meet in Washington within "the next week or so" after an agreement on the basis to resume peace talks. "Their demonstration of leadership gives me great hope that we may finally see progress towards the objectives which they share along with their friends and allies around the world: peace, security and dignity for their peoples," said Ashton. Ashton praised Kerry "for his determination in bringing the parties back together. Of course there are difficult negotiations ahead and difficult decisions to take. The European Union will make every effort to ensure that negotiations succeed." Several hours earlier, the EU published new guidelines which forbid member states from funding or dealing with Israeli entities in areas located beyond the 1949 Armistice Line. These include Judea, Samaria, eastern Jerusalem and even the Golan Heights. On Thursday, Israel met the British and French ambassadors and Germany's deputy envoy over the guidelines. The envoys were warned of a serious crisis between the European Union and Israel over the move. Israeli experts said on Friday that the implications of the policy could have a major impact on how Israel does business with the EU. Finance Minister Yair Lapid pointed out in an op-ed published Friday that while the EU says the new guidelines will promote peace, the opposite is true and in fact will encourage terrorists.